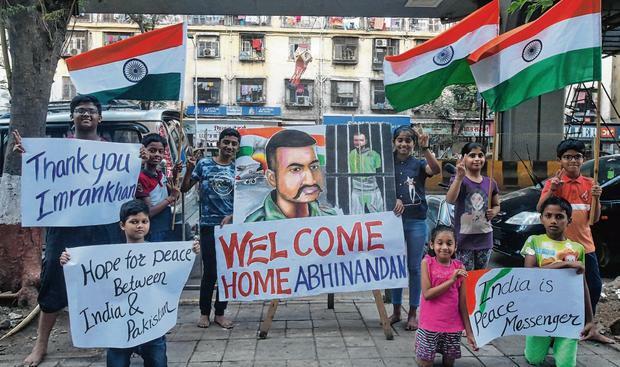 Indian military officials have welcomed Pakistan's planned return of a captured pilot, but refused to confirm they would de-escalate a conflict between the two nuclear powers. "We are happy our pilot is being released," said Air Vice Marshal RGK Kapoor, at a joint news conference of India's three armed forces yesterday. He did not say when asked by reporters if India considered the return a de-escalation in the conflict. Pakistan's Prime Minister Imran Khan said the pilot would be released today, to the relief of many Indians, even as his military reported that four Pakistani civilians had been killed by India firing across the disputed border in Kashmir. The United States, China, the European Union and other powers have urged restraint from the two nations, as tensions escalated following a suicide car bombing that killed at least 40 Indian paramilitary police in Indian-controlled Kashmir on February 14. On Tuesday, India said it hit a training camp for a Pakistan-based group that claimed responsibility for the suicide attack, and a senior government source told reporters that 300 militants had been killed. Asked about the damage caused by Indian warplanes in Tuesday's air strike, Mr Kapoor said it was premature to provide details about casualties. But they said they had "credible" evidence of the damage inflicted on the camp by the air strikes. "Whatever we intended to destroy, we did," he said. Pakistan's decision to release the pilot came after several countries offered diplomatic assistance to mediate between two countries that have gone to war three times since their independence from British colonial rule in 1947. US Secretary of State Mike Pompeo said he had spoken to the leaders of both countries and urged them to avoid "any action that would escalate and greatly increase risk". Earlier, US President Donald Trump said he expected "reasonably decent news" regarding the conflict between India and Pakistan, adding that the United States was trying to mediate. "They have been going at it and we have been involved in trying to have them stop," Mr Trump said in Hanoi, where he was attending a summit with North Korea's leader. "We have been in the middle trying to help them both out." Russia's Foreign Minister Sergei Lavrov also offered to facilitate talks between the two sides. Mr Khan has already called for talks with India to prevent the risk of a "miscalculation" between their militaries. Earlier yesterday, India's Prime Minister Narendra Modi, who faces a general election in a matter of months, told a rally of supporters that India would unite against its enemies. "The world is observing our collective will. It is necessary that we shouldn't do anything that allows our enemy to raise a finger at us," he said.